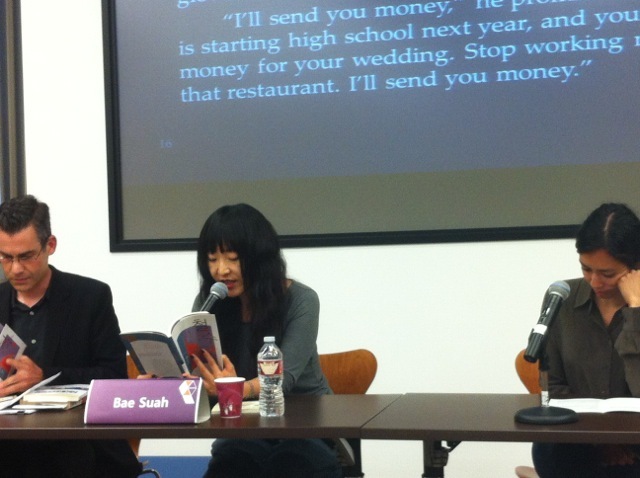 I had the chance last week to interview Bae Suah and Cheon Myeong-kwan, two well-known Korean writers, when they came to Los Angeles under the auspices of the Literature Translation Institute of Korea to make an appearance at UCLA. Not one to miss a podcasting opportunity, I packed up my recorder and rode over to where they were staying, a medium-size “design hotel” on Melrose I’d never once had reason to notice before. Incidentally, its name, Palihotel, gives me something to talk about with my Korean-English speaking partner: why isn’t it “The Palihotel”? And more interestingly, why do I keep wanting to call it “The Palihotel”? Though born and mostly raised in Gwangju, this staffer spent ages seven through ten in Austin, Texas — a period formative enough to somehow leaver her with a more convincing American accent than I hear from many American-born Koreans. 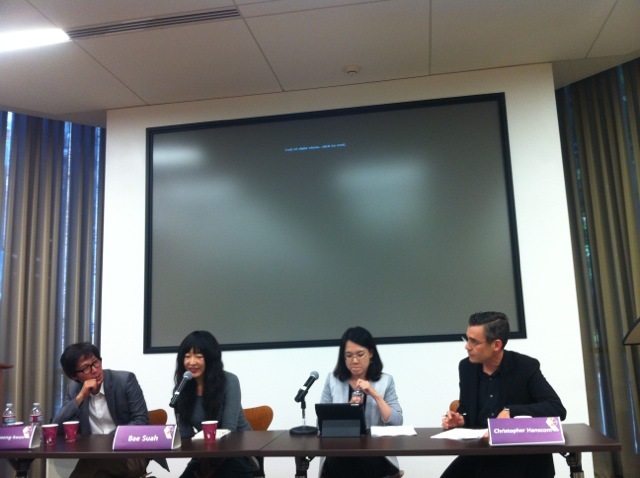 She interpreted during the podcast recording, translating my questions into Korean and the writers’ answers into English. That skill, like sight-reading sheet music, never ceases to amaze me, and I found myself all the more impressed by it when I understood enough of the original language to follow the answers as the interviewees gave them. My own Korean hasn’t yet reached a level where I can interview anyone directly, or even have prolonged conversations of much depth — when I miss a word, it tends to be the most important one in the sentence, and when I can’t think of a word, I tend not to know any substitutes for it either — but this experience did help fill out my sense of what podcasting my fast-upcoming life in Korea might make possible. The prospect of some kind of multilingual project gives me another reason to study even harder (as if the threat of falling too far in with the English-only, culturally apathetic section of Korea’s foreign population wasn’t motivation enough). But if I want to accomplish that, I’ve got my own articles to master — or, rather, particles. Students of Japanese might wince at the painful memories this dredges up of struggling to grasp the differences between は and が, but the finer points of Korean’s 은/는 and (especially) 이/가 make even less intuitive sense to the English-speaker. You can sometimes get by, more or less, leaving them off entirely, but the aforementioned speaking partner warned me that when Koreans want to act out a “dumb foreigner” stereotype, the first thing they do is drop the particles. (Though we, of course, do the same with English articles: “I ride bus.”) Another Korean friend let me in on something else stressful: when his countrymen see a Korean interacting with a foreigner in Korean, they pay close attention indeed — more with an eye toward evaluating their fellow Korean than the foreigner, but still. I experienced that yesterday when, biking down Wilshire, I happened to spot Cheon Myeong-kwan having an after-lunch smoke outside (of all places) one of the westerner-oriented Korean barbecue joints outside Koreatown. As we chatted about his brief experience of Los Angeles during the trip (too brief, as all trips to Los Angeles are — the flea market fan Bae Suah won’t even have had a chance to experience the Melrose Trading Post, let alone the Rose Bowl) and my own plans in his homeland come November, a Korean family passed by. They heard us talking, then stopped in their tracks and simply stared for a while — taking notice of my particle problems, surely, but Dr. Johnson, dogs, hind legs, etc. I wonder what they would’ve thought if we’d been podcasting. This was written by Colin Marshall. Posted on Thursday, June 4, 2015, at 7:32 pm. Filed under diary, Korea, Los Angeles. Bookmark the permalink. Follow comments here with the RSS feed. Comments are closed, but you can leave a trackback.